It’s not too surprising if you’ve never heard of Fujita Engineering. 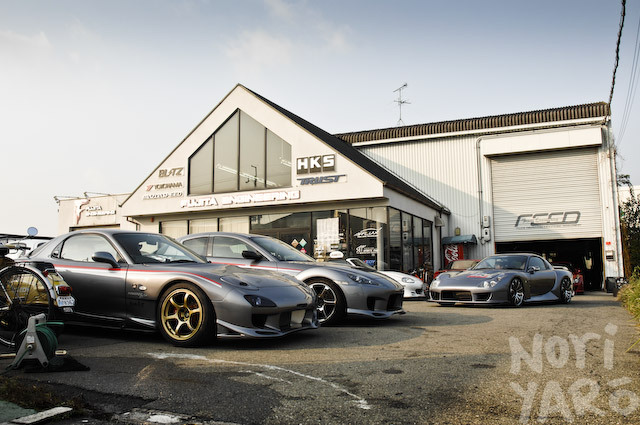 Unlike one of the other big rotary tuners in Japan that is constantly exposed to the general public, Fujita really only concentrates on the people that matter; rotary owners. Shop owner Yoshihara Fujita owns quite a few decent RX-7s, but this is the one he drives to work every day, a full Afflux Version V kitted Series VI. 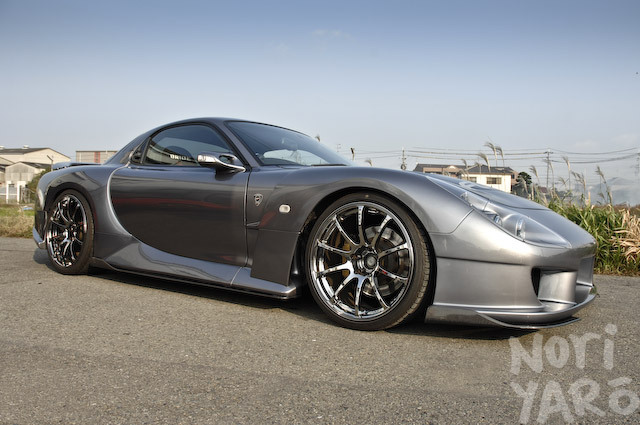 It’s easy to see a lot of the inspiration in its design of the Afflux Version V kit, as the front end is reminiscent of a TVR Sagaris, and the quad brakelights could be mistaken for those on a Ferrari F430 if glanced at quickly enough. I asked if any particular car had inspired the design of the Afflux V kit, to which Mr Fujita folded his arms, cocked his head to the side and considered his answer carefully. “It’s Euro-style.” he said with a smile. 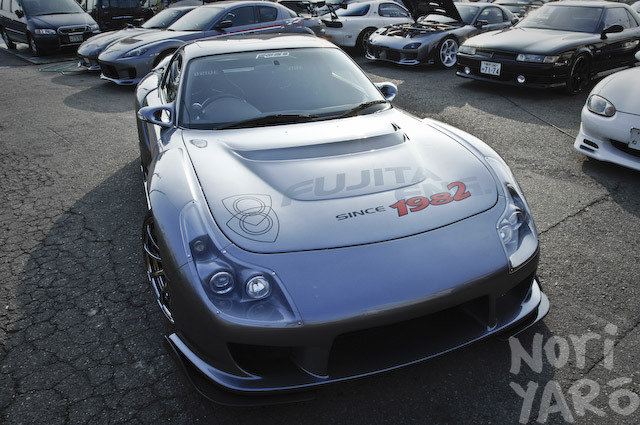 The body of the car wears a first-generation FD3S VIN-number, and the reason Mr Fujita chose with this particular model was because it came with a steel sunroof that was only available on this particular model as a dealer option. Just to confuse the issue even further, a complete interior was lifted from a series VIII and installed in the car, complemented by a pair of carbon-kevlar backed Bride Low-Max Gias III recliners. The engine bay might not look like anything too special, but it houses a rebuilt Series VIII engine with a street port, retaining the factory twin-turbo setup, albeit in a high-flowed form. A slightly customised Apex’i Power FC controls the tune, and various FEED bolt-ons litter the car, such as the intercooler, thicker twin oil coolers, remote-header radiator and stainless manifold and exhaust. The brakes have been upgraded with Grex Alcon calipers behind 19in Advan Racing RS wheels, with 255/30ZR Advan Sport tyres on the front, and 265/30ZR on the back. Not a bad daily hack. More from the Osaka Fujita Engineering workshop coming soon. Damn! Now that is a REALLY clean Rex. My favorite one has to be the 2007-2008 one, that was featured on some Hot version touge battle videos. Amazing daily driver. Someday I will be a famous tuner in Japan and change my name to Fujiwara. Then I will have a badass daily driver just like this. LOL. far out thats so rad. Yeah s0ap, I have that issue from the summer. These cars look pretty clean I like them. They would look amazing cruising down the streets in they city. The FD of Touge Battle is one of the best. 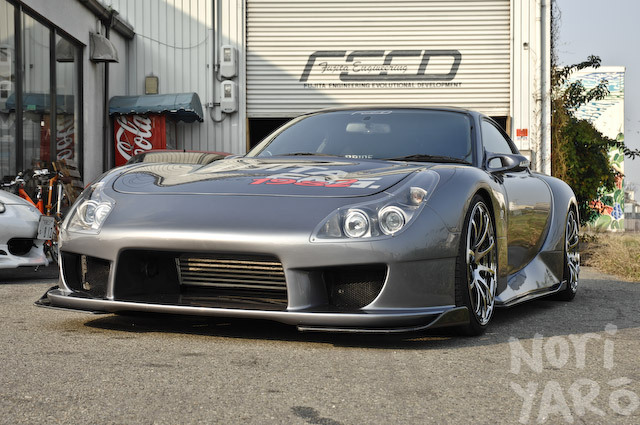 But this FD was in Fuji with Advan White Wheels and looks vey good with that wheels. That car will feature in an upcoming post. wow impressed with the pics,wish if all these would be high res enough for a wallpaper,totally dig the 1st,2nd and last pics with all the cars…nice post..
Love your work, can’t wait to see more updates from the Feed workshop. Nice,but what the fak did they do to the back ..? they should have just put a diffuser in or something ..